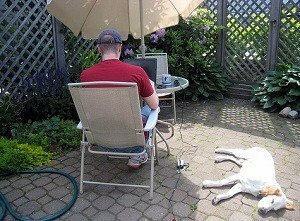 Telecommuting from Home or Working in a Traditional Office? Home » Job and Career » Telecommuting from Home or Working in a Traditional Office? Recently, Yahoo! CEO Marissa Mayer sparked a debate when she decided to require employees to come into the office. Thanks to the Internet, it’s possible for more people to telecommute. Indeed, Yahoo! has been known as a telecommute-friendly workplace. This new announcement changes things and places the emphasis on working from a more traditional office. In a world where a lot of office-type work can be done from a home office, Mayer’s announcement riled a lot of people, especially those who In a world where a lot of office-type work can be done from a home office, Mayer’s announcement riled a lot of people, especially those who have become used to the flexibility of telecommuting. But, as nice as working from home is for me, it’s not for everyone. Like many of the employees at Yahoo! are going to have to do, you need to figure out where you are most likely to thrive. Presence of someone (a boss) to help keep you accountable and on task. There are those who thrive in such an environment. My husband enjoys working outside the home, seeing his students. He also finds it easier to accomplish more work when he is in an office setting. As a result, he often goes in to his office at the university on Friday, even though he doesn’t have classes to teach. He can grade papers with fewer distractions at the office, and then come home and focus mainly on being with his family. The flexibility that comes with working from home is one of the big draws for me. While deadlines exist, for the most part my home business allows me a great deal of flexibility. I set my own hours, and can even “fire” clients if I am having a hard time with them. While I sometimes miss the social aspects of an office, that is often remedied by a quick hop on to my buddies on Skype. There’s almost always someone to bounce ideas off, or just to have a bull session with. Additionally, I can decide to go to lunch with one of my friends in town, or meet up with my husband for a matinee movie. If I need to shift something to another day, I usually can. I’m sure that many of the developers and other that choose to work from home feel the same way — except now they have to go into the office if they expect to keep their jobs. Sometimes, though, it can be difficult to stay on task. I might be more distracted some days. Additionally, there are times when it’s hard for me to get away from work. The fact that I have a dedicated workspace helps create some separation, but the reality is that the work is never really done, and the physical distance from the work just isn’t there. My case is a little different, of course. I run a home-based business; I’m not working for a more traditional company. When you work for a company you might have to go in to the office. However, companies can boost morale — and even productivity — by allowing workers to telecommute at least some of the time. This is a job perk that is increasingly prized these days. Taking it away from those who prefer the home office to the company office can cause problems. One compromise is to allow telecommuting one or two days a week, and ask workers to come in the rest of the time in order to promote cohesion as a work unit. A part-time telecommute can help keep up morale, while encouraging teamwork and building strong bonds between employees. What do you think? Do you work better from home? Or do you thrive in a more traditional office setting? Would You Rather Have Better Perks or a Higher Salary? I would love to have the option to work at home. My industry (higher ed) doesn’t usually like it because those who serve students need to be on site. But I don’t serve students directly, so why can’t I work from home a few days a week? Because “if we do it for you we have to do it for everyone.” Why? You’re the boss. You can make the rules. I hate that argument. You are right – giving me the option would definitely boost morale. And might even lead to more productivity if done correctly. Very interesting debate. I’ve always felt that the ability to work from home offers parents flexibility and means hat employers don’t lose out on the best talent, by driving those with children or long commutes into other businesses. I think that Yahoo has actually taken a massive step backwards. The truth is that you need both. You need to have the flexibility to work from home combined with the creativity that being in a bustling office can bring. I am certainly not the norm, but I do really like going into the office. I’ve worked from home and I love getting up, getting dressed nicely, and going to work. I also like the interaction, but I do really like working from home for the lack of commute.